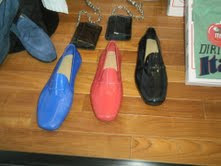 On the way home on Friday, I noticed these shoes in a Juban shop window. Kind of a Gucci-style loafer but made of pure plastic. Aren't they ridiculous? Who would buy them? Let's hope they are just for display. Given the popularity of plastic shoes among young Japanese women I can not be sure about this. I will keep an eye out for any well-heeled gents sporting the slip-ons but that might not be until Halloween. In all fairness, I have owned a pair or two of plastic shoes in my life. There were the purple pumps that were all the rage in New York in the 80s, the red Crocs that I held onto for about a week before deeming them too ugly for public viewing, and the black, Issey Miyake slippers I sometimes don during rainy season. They now seem destined for an early retirement since they make socks slip and generate heel blisters. Can you say "design flaw"? While I do like a good pair of high-quality flip-flops (I wonder what happened to those nice Reef brand blue ones that went to camp with Eve last summer? ), this whole flip-flop boom has gotten out of hand. And if someone could come up with a suitably fashionable and durable alternative, I would stop buying leather shoes altogether.